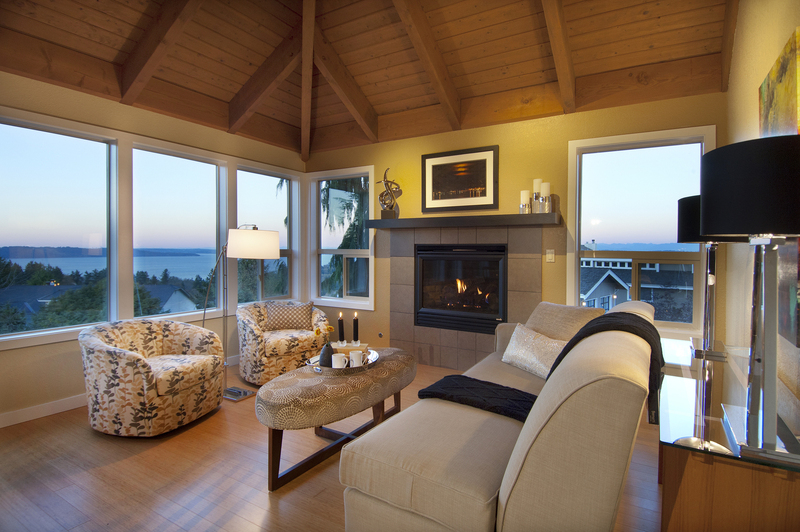 There are many ways to combine Feng Shui and interior design. Transformations for Interiors LLC will meet you at your project site or at our Seattle Design Center to discuss your venture. If you provide a floor plan, we can lay the Feng Shui Ba-gua on your space. We will discuss all aspects of your plans, addressing any questions, thoughts or concerns you might have. You will be asked to complete the first of two written surveys that will help us gain an understanding of your needs, goals and preferences. Our goal is to create a space that is as unique as you. We charge $350 for this service. If we jointly agree we will make a good partnership to work together, we can move forward with a Letter of Agreement that includes the scope of work to be completed. Clients and customers will feel welcomed into an inviting space, and you will feel energized and well-organized in your new office space. If you want to bring in more business, we can help. If you want your employees to be more productive, we can help. You are going to love a space where you get more accomplished and you are more successful. Are you challenged by creatively displaying art in your home or office? We will come into your home or office and hang/rehang some/all of your art so that it shows off your amazing taste. We can also help you acquire art that is as unique as you, and will be displayed beautifully. We charge $500 for this service. Want to decorate a room in your home but need a guide to assist you in selecting the right pieces for your space? We will spend a day, starting at your home, taking measurements, and then shopping with you to ensure you get the right size, style and colors to make your space look and feel fabulous. We charge $1000 for this all day event. Color is a great way of creating just the right environment for any given space in your home or office. We can spend a few hours determing color schemes for the rooms in your new space, for which we charge $400, or provide a more in -depth process by applying 12 x 12 paint samples right on your walls for $750, to ensure your selections will look and feel just right to you. 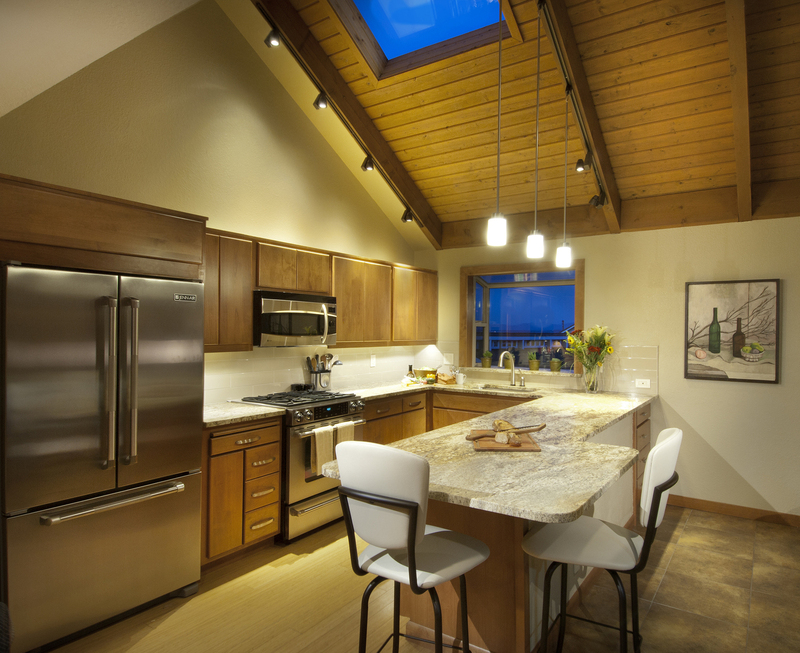 Create magical moments for your family and friends in your new gourmet kitchen. Envision your kitchen full of rich and comforting aromas from your powerful professional stainless steel range. Taste your perfectly prepared meal, and envision a toast to those you love. You will savor the memories of fun gatherings long after your ultra-silent dishwasher dries the last dish for you. Imagine slipping into your luxury spa tub with the soothing warmth, soft music and glowing candles in your own private sanctuary away from the stresses and demands of your intense schedule. Retreat to your personal oasis from your over-stimulated world of endless carpools, coordination of details and schedules to your private suite created just for you. Relax and enjoy the soothing textures and calming colors coordinated to give you the perfect respite from your daily stresses. Imagine walking into the foyer of your home. Ahh... take a deep breath, and let go of all the day's worries as you enter your sanctuary. In feng shui, the entryway is considered the "mouth of Ch'i" or breath of life for your entire home. We will take time to make this area of your home truly awe-inspiring for all who enter. Invite your friends to watch your favorite movies and enjoy a relaxing evening in the comfort of your own state-of-the-art cinema. Feel the rumble of the cars, hear the roar of the engines, and taste the buttery smell of the popcorn as you settle into your perfectly appointed home theater. We use the latest illumination technology to create the perfect ambiance when the lights dim at exactly the right moment. Create an inviting and comforting place where your newborn, elementary-age or teen can not wait to be after a busy day at play or school. They will look forward to spending time in their room, because it is custom-designed with their preferences and needs in mind. "I love my living space and it lightens my mood to be at home now. The initial consultation was responsive to my needs, thoughts and ideas, and respectful of my opinions. Shelley was knowledgeable about the field of interior design, courteous at all times, and helpful in making decisions. "When another need for interior design arises, I will contact Transformations to assist me, and I recommend Shelley to friends and family." 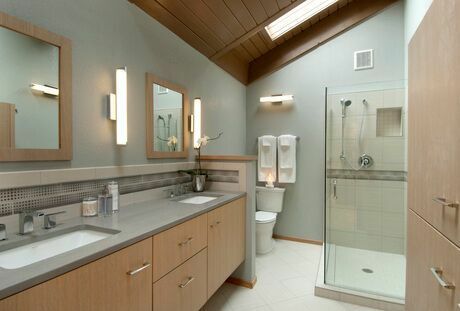 This spa-like master bath uses the neutral color scheme of grays and beiges. Radiant flooring under the diagonally laid porcelain tile create a warm yet spacious feeling. Both custom vanity and linen closet are floating to also give a sizable feeling with ample storage. 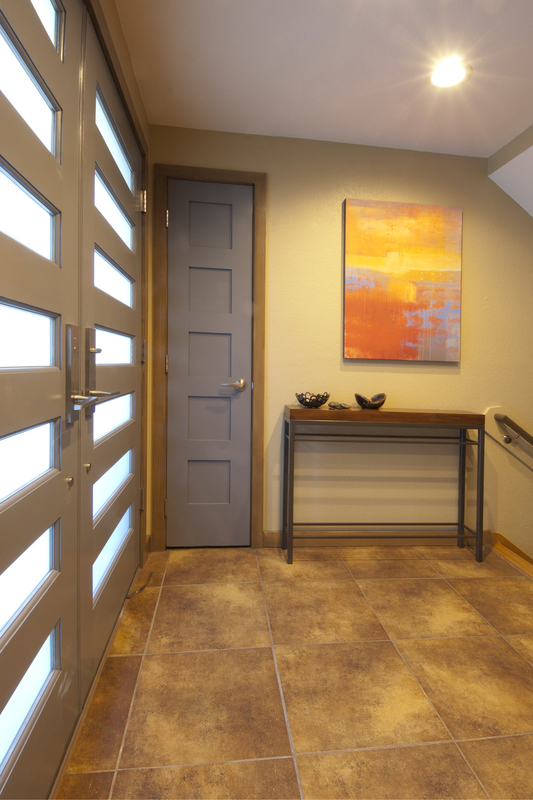 The entryway is one of the most important areas of a home in feng shui. Double entry doors are not only modern, but beautiful. They allow as much light as possible light to enter, while affording the home owner privacy through their glazed glass.